This week's "Less is More" challenge is to use acetate on your creation. Yes, I did gasp when I saw that yesterday as I checked out what was in store for this week for the LIMettes, but I took a deep breath and came up with this card based on a Christmas card that I made at a SU stamp camp a few years ago. I had some SU acetate that I cut and folded into an A2 size card. 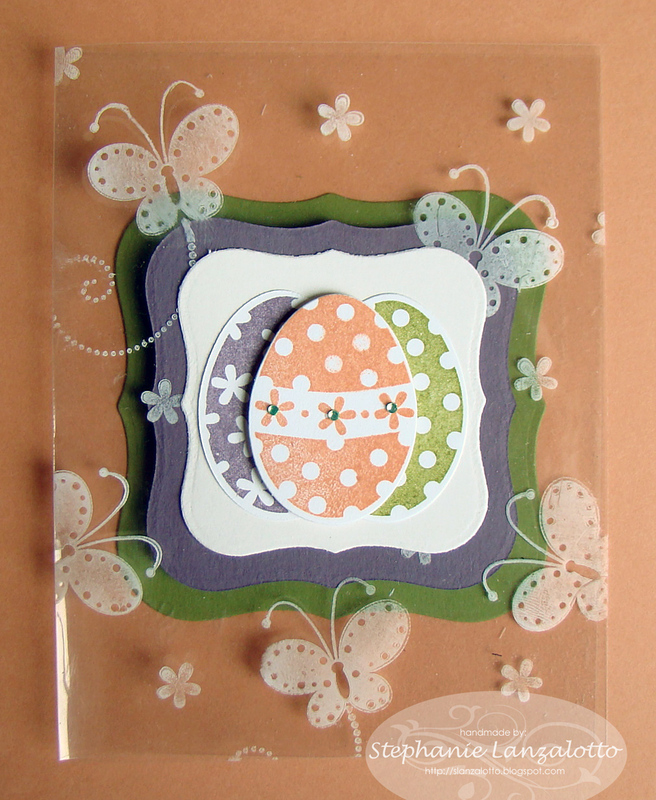 I randomly stamped the butterfly and little flower from PTI's "Egg Hunt" in SU Whisper White craft ink on the front of the card. Warning - it rubs off easily, so you have to be careful when you touch it. I wish I had white alcohol ink for this... oh well. I achieved the desired affect with the craft ink. 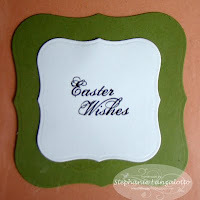 I cut the eggs using the PTI Egg Hunt coordinating die and stamped them with Groovy Guava, Old Olive and Perfect Plum Ink. I added tiny green self-adhesive rhinestones to the Guava egg. That egg is popped up with Dimensionals between the olive and plum eggs. I love the placement of the layers. 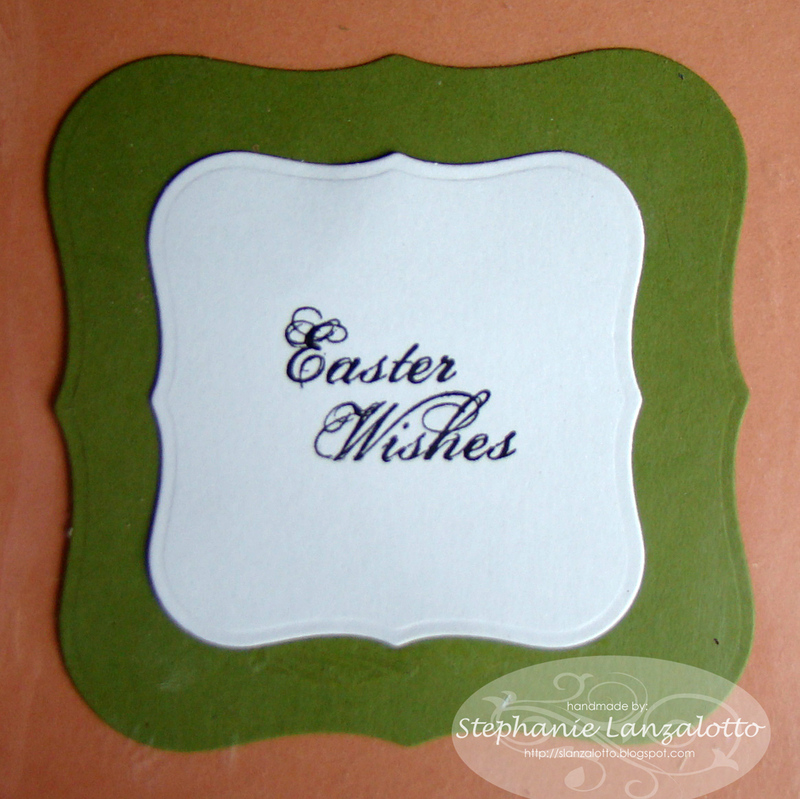 I cut the Olive, white (SU Shimmery White) and Plum layers using 3 sizes of Nestabilities Labels One dies. The green layer is adhered to the BACK of the card. The white layer on the inside is adhered on top of the green - the acetate layer is in between. The front is done the same way. The white layer is adhered to the front of the card. The purple layer is BEHIND the acetate. I love the affect! Thanks Lucian for this great idea! The sentiment on the inside is from SU's "All Holidays" set and is stamped with VersaFine Black Onyx ink. The white inside layer is the same size as the white layer on the front. Initially I made that layer the same size as the plum layer, but it showed a little around the edges when the card was not completely closed. I am going to head over to the LIM blog to see what my fellow LIMettes have created! Thanks Chrissie and Mandi for making me pop out of my comfort zone once again. Have a great Sunday and thank you for stopping by! Well done and so bright. Such a lovely Easter card. I love those stamped butterflies! Thanks for rising to our challenge! Stephanie, this is just as cute as can be!! Very 'Eggs'pecially pretty! Love those butterflies too!